A hot tub was something I wanted for years. But living in a tiny apartment in the city meant I could barely squeeze a sofa, let along a whole hot tub. Imagine my delight when I finally moved into my new house and discovered how enormous my terrace was. There was only one thing on my mind – Finally, I have the perfect place to make my wish a reality. And oh, how amazing it is to have a hot tub on your terrace. You get to soak in warm, bubbly water while you soak up the delightful sun rays. This, combined with a spectacular view makes for quite a magical feeling. If you ever have the opportunity to add a hot tub to your terrace, I strongly encourage you to do so. After years of unwinding and enjoying the warm water with family and friends, my happiness was disrupted when my husband pointed out the puddle of water next to the tub. And believe me, there’s nothing worse than realizing there’s a leak in your tub. Tracking down where the leak comes from can be extremely frustrating, especially when it’s minuscule. Even when my husband was 100% sure he had correctly located it and fixed the leak, the water still found its way out. While it may be true that some leaks can be fixed on your own, in many cases the situation calls for a professional repair hot tub service or a plumber. It’s important to point out that even the simplest spa still consists of many different components and has a complex electrical system powering it, and meddling with it can cause further problems. This means that if you’re not completely confident in your spa knowledge and fixing skills, enlisting the help of an expert is certainly the best decision you could take. Besides locating leakage points precisely and quickly, a professional spa technician can also perform a detailed exam of the state of the spa. Other common problems that can arise from leaks are damaged pump components, malfunctioning heater elements and a damaged filter or a GFCI that’s tripping. The professionals that repair hot tub will also make sure to inspect those tricky parts as well. 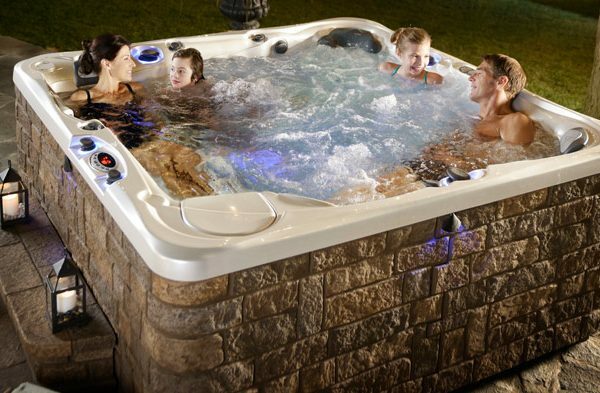 If you already own a hot tub, you are probably well aware that it is an expensive investment that should last more than a couple of years. You may try to maintain it in perfect condition by regularly cleaning the filters and performing desalination. However, the best thing you can do for your spa is not to ignore any malfunctions or try to fix them yourself. My personal experience has thought me that it’s always better to be safe than sorry. If I hadn’t called in the professionals on time, the pump would have surely failed which would have cost me even more than I paid for the leak fix.